Let’s start with your main reason for wanting a watch specifically for hiking purposes: Where do you hike? How often? Is this for long-term use? Is this for a beginner or expert? Gift? Price range? Specific features you want to be included? All of these questions will help narrow down your search so that you can focus on the best buy for you versus all of the input you will get from the internet. When you have narrowed down your range of selection, go and research: look at reviews, visit brand’s website, check on warranties, etc. The best watch for your hiking experience may be different than the next person. So, I would recommend utilizing various tools to conduct your research and then narrow down by price, quality, and features that are most important to you. In this article, I have created a Top 5 watch list for hiking and camping. As well, I have presented all of the key features of each watch for easy sorting. This list doesn’t just have one type of watch in comparison to the next, they all have different features and capabilities and range in price, giving you an idea of what you could potentially spend based on your needs. Enjoy and happy hunting! The Garmin Forerunner 735XT is the most advanced watch from a series of 5 in the Forerunner collection with extra features the others do not include. It involves the capability of using Garmin Connect, IQ, virtual pacer, stress, and Strava score. Garmin Connect allows you to personalize your watch face, apps, and workouts while giving individualized coaching that you can program for yourself. This feature allows you to connect via Bluetooth to your phone or computer and can be set for smart notifications when you are away from your mobile phone. Also, all of the data you want to be transmitted can be done so via Bluetooth and communication can be sent to your social networks and more. This watch comes in black/gray and midnight/frost blue and weighs 1.6 ounces. The battery life is up to 24 hours in UltraTrac mode and holds 80 hours of activity data and comes with a limited warranty. 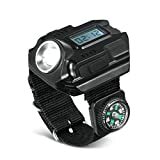 The Night Eyes Wristwatch with LED light and compass is ideal for hiking and camping. The LED display shows time and date, with a built-in rechargeable lithium battery, so there’s no need for replacement. The Night Eyes watch is ideal for users of all ages, with simple buttons and easy-care. The great thing about this brand is that there is a 30-day guaranteed warranty for your money back or a new watch, with an optional 1-year warranty, as well. 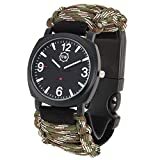 I would highly recommend this functional watch for the person who is just needing original watch features, for camping and hunting there is no navigation or compass tool included and would not be a reliable navigator. Timex does offer a 1-year warranty and a customer service help desk for all customers to use. It uses one lithium metal battery that comes included but must be replaced (battery life is unspecified). However, it has standard watch life with the included battery. This watch is ideal for tracking your data and activities. It is compatible with a heart rate monitor, bike clip, or cadence sensor -perfect for getting even more precise readings depending on your activity and lets you transfer and store all of this information in the device, as well through the wireless connectivity of the accessories. Once you have completed your activities for the day, you can upload all of your progress, favorite stops, and share with others using Garmin Connect. You can even share your experiences on Twitter or Facebook. It comes with BaseCamp features so you can view and organize your maps for upcoming trips and even displays topographic map data in 2D or 3D through your computer. This watch has put a lot of thought into what the average user may want and is a great purchase that is affordable and functional with many features competitors don’t offer. It comes in black, with a green face and weighs 3 ounces; The watch requires two AAA batteries (not included) with a life up to 17 hours and comes with a 1-year limited warranty. This watch is very competitive in price and quality compared to some other affordable brands. The disadvantage to this watch is that there are no high-tech features for synchronizing or recording data. This watch is ultimate, just for functional use and not to keep up with your data, activity, progress, or used as a navigation system. The features of this watch are ideal for camping, hiking, and fishing and are a great purchase for a buyer who has one too many tools and accessories when going into the outdoors. It comes in black, pink, tan, and camo and has a warranty that is undisclosed, but available if you contact the seller directly. I hope that this article has helped in your decision process to buying a watch for hiking. There have been a variety of watches with different features and capabilities presented, keep in mind your price range, must-haves, and uses when purchasing. Of course, there are many brands and styles available, the ones I presented were based on reviews and most frequently bought. When looking for the best watch for hiking, remember what it is that you need and feel confident enough in your purchase provided that you did your research. Many could be the correct match for another buyer and to decide what will work for you best is key. I hope that you find the watch you are looking for and look forward to providing more information on items that help make our experiences even better. Take this article as a base and begin to apply your research and development into your purchase and enjoy your next trip into the outdoors!